Stefano Tripney is a MovNat certificated team instructor, natural movement fitness trainer, and martial arts instructor based in Victoria, BC. Stefano creatively bridges the inner workings of the mind and body with our collective external landscapes in order to explore, learn, experience, and play with the world and our place in it. He is known for his bright energy and ability to inspire mindful execution, technical skill, physical competence and limitless creativity. 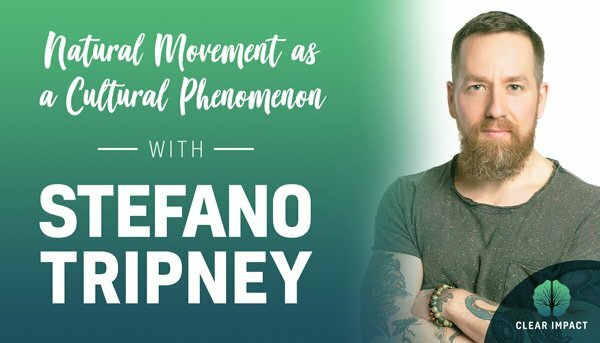 Today we’re excited to have him on the show where he’ll be sharing his take on natural movement as a cultural phenomenon, and how you can get involved and get started on your own natural movement journey. What is happening culturally around the outdoor natural movement? What can we do about it to live more vibrantly happy? The importance of goals on your natural movement journey. What is the MovNat Brand, what skills are needed, and how is it taught? What are manipulative skills vs locomotive skills? How locomotive patterns develop throughout the human lifespan, especially during infancy. Is there a mental capacity that is lost from lack of movement? How taking movement out into nature can change your perspective. The first things people generally try in order to get healthy are diets and gym memberships. Why? What are some of the things people can start to do to stimulate the body and the mind in a fresh way? How do you manage risk and danger levels in changing environments? What can people do in the workplace to be more connected to their natural movement? How the pieces of technology we’ve created, such as furniture, should be considered in your natural movement. How critical is community in relation to our ability to understand movement in a way that is more natural? How do injuries play a part in your movement journey? Is your environment stimulating you? How to get in touch with Stefano?